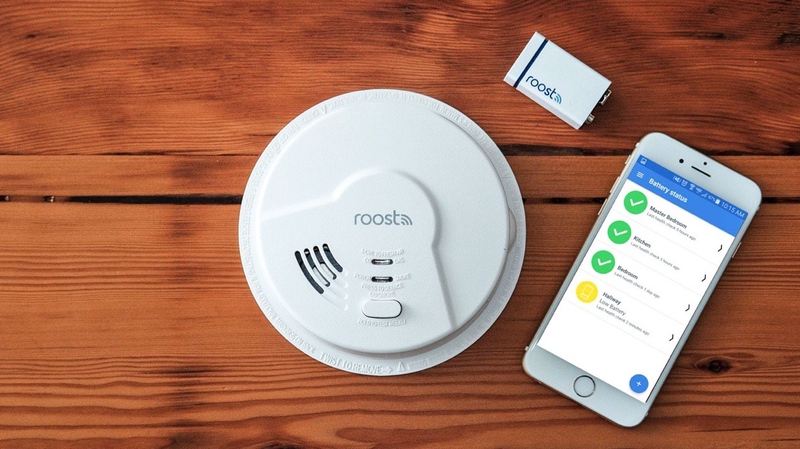 Roost, a company that has been making smart batteries that can turn any smoke detector into a smart one, is now making its own alarms that look set to rival Nest's Protect setup. The two new models include the RSA-200 smoke and fire detector and the more expensive RSA-400 which also adds the ability to detect carbon monoxide and natural gas. Both of the detectors use the same Roost smart battery, which boasts Wi-Fi connectivity to pair with a companion smartphone app. There you'll be able to get alerts and tell you when it's time to replace the battery. It also provides a backup power in the event of a blackout. When the battery does run out, you can remove the Wi-Fi module and snap it onto a new battery which will cost you $15. They also feature a Universal Smoke Sensing Technology that uses a microprocessor that's able to detect various types of fire and is apparently 87 percent faster at detecting a fire than current smoke alarm standards. Roost also works with IFTTT, so you can set up recipes to call your phone or even to turn on your Philips Hue lights when the alarm is raised. The good news is that the Roost detectors are pretty affordable. You can pick up the RSA-200 for $60 and the RSA-400 for just $80. That's cheaper than what a Nest Protect costs but it's still more expensive than a standard alarm. You can pre-order one from the Roost website now and it's expected to start shipping in June. If you're interested in all things smart home, you should see how our editor in chief Paul is getting on building his smart home from scratch.